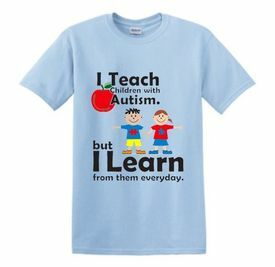 Autism Awareness Adult Shirt "I Teach Children With Autism, But I Learn From Them Everyday" By popular demand these are now available in light blue! Teachers were telling us the white shirts were getting dirty too fast from being with their kids all day, so we now have these available in a nice light blue. They are made of 100% preshrunk cotton. Autism Teddy Bear "I Love Someone with Autism"